Click here to buy direct from us. 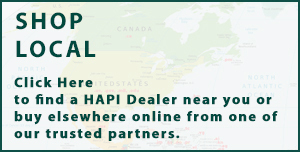 Click here to find a local shop. We accept all major Credit Cards (Visa, MasterCard, American Express, Discover). Prepare a list of items desired. Call us at (559) 642-6248. Orders ship out within 1 - 3 business days (excluding weekends and holidays). We are located in Oakhurst, California and can ship to virtually any address in the world. We use UPS and USPS as our carriers. For orders within the United States: Orders ship from us here in Oakhurst, California. Our online store will display all shipping options and calculate costs when you check out. 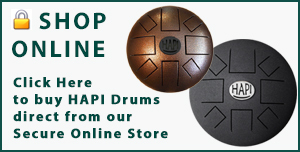 HAPI Drums have a shipping cost between $22 - $54. When calculating delivery time, the day the package is picked up from us is not factored as a transit day. Weekends (Saturday & Sunday) are also not counted as transit days. California residents will have an added 8% sales tax. For International orders, shipping OUTSIDE the United States: We are currently only shipping outside the US to Canada. Shipping is between $45 - $120 for 5-10 day delivery. The item then has to clear your countries customs department. This can take another 10-15 days depending on how busy they are. There also may be additional customs clearance charges or taxes that your country may charge you upon delivery. We are not responsible for any customs charges or taxes that your country may charge you upon delivery of your product(s). All prices on our website are in US Dollars. Click here if you need a currency conversion. Returns/Damage Policy: All orders are insured for damage. If your order is damaged in shipping please keep all the packing materials and call us immediately at (559) 642-6248. We will file the claim for you with the shipping company and send you out a replacement product right away. Satisfaction Guaranteed. You have a 7 day evaluation period. If not satisfied, return product(s) within 7 days of receiving your order. If this is a gift, the evaluation period will begin once the gift is opened by the recipient Item(s) must be in new condition for an exchange or refund (less shipping costs incurred). Item(s) must be returned with all original packaging and accessories. We'll pay any return shipping costs if the return is a result of our error (you received an incorrect or defective item). In the event of a return, you will receive your refund within three weeks of returning your package. This time period includes the transit time for us to receive your return from the shipper (5 business days), the time it takes us to process and evaluate your return once we receive it (5 business days), and the time it takes your bank to process our refund request (5 to 10 business days). On returns purchased with a credit card we will need to deduct 5% from your refund to cover the credit card processing fees. Undeliverable Packages. On very rare occasion a package will be returned to us as undeliverable. When USPS or UPS returns an undeliverable package to us, we issue a full refund (excluding shipping charges). An incorrect address is the most common reason for this to occur. Please double-check your shipping address carefully when placing your order. On undeliverable packages purchased with a credit card we will need to deduct 5% from your refund to cover the credit card processing fees.